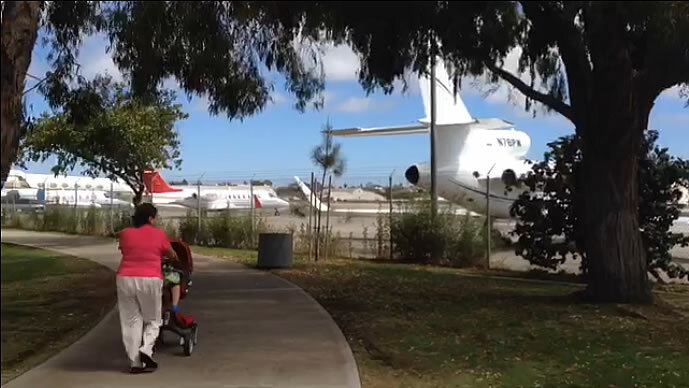 I was biking down Ocean Park Blvd, four blocks away, and could hear the jet idling from there. So I rode over by my bike to where the southern end of the playing fields at Clover Park are cut off by the Santa Monica Airport Runway only to find the jet was still idling – pouring toxic particulate matter directly into the lungs of those passing by in Clover Park. While there, I saw women with infants; elderly people; children playing soccer and baseball nearby – who had to be breathing the ultrafine jet pollution from this idling jet – which are the cause of lung disease and cancer. Fueling; starting up; and idling lead-burning planes and jet-fuel-burning jets that are located just 20 or 30 feet from where children play, is completely unacceptable. Please go here for more information on jet air pollution. If you’d like to show your support for the Yes on LC, No on D campaign (whether it’s canvassing, donating, or just displaying a yard sign) please go here and take the pledge!